The city of Lake Stevens is a rapidly growing suburb of the Seattle-Tacoma-Bellevue metro area, located in Snohomish County, in the Puget Sound area of western Washington. With a population over 28,000 and a convenient location between Everett and Marysville, just 30 miles north of downtown Seattle, Lake Stevens is an increasingly popular choice of residence. The city itself is wrapped around a 1,000 acre lake of the same name and is a favorite recreational and wildlife viewing area for locals. 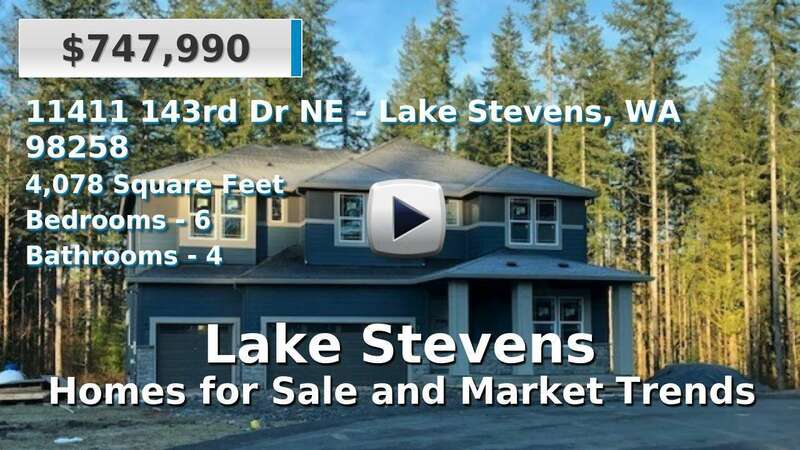 Homes for sale in Lake Stevens are much newer than most areas of the state and continue to be built as the city expands. 4 Beds | 2.5 Baths | 2297 sq. Ft.
4 Beds | 2.5 Baths | 2399 sq. Ft.
3 Beds | 2 Baths | 1248 sq. Ft.
4 Beds | 2.5 Baths | 2478 sq. Ft.
3 Beds | 2 Baths | 1732 sq. Ft.
4 Beds | 2.5 Baths | 3072 sq. Ft.
4 Beds | 2.5 Baths | 2424 sq. Ft.
5 Beds | 3.5 Baths | 3460 sq. Ft.
4 Beds | 2.5 Baths | 2856 sq. Ft.
4 Beds | 2.5 Baths | 2345 sq. Ft.
5 Beds | 3.5 Baths | 2738 sq. Ft.
4 Beds | 2.5 Baths | 2219 sq. Ft.
4 Beds | 2.25 Baths | 2472 sq. Ft.